Many problems are associated with moving safes or a heavy fire cabinet. 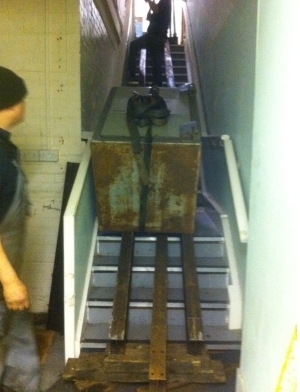 Our safe removals service teams are experienced when it comes to moving safes without causing damage. At Kwik Fab Ltd, we have the specialist equipment and expertise to conduct the safe and secure removal of any safe or security vault. If you a require a safe relocate for any reason or if you simply don’t require it anymore – it is best carried out by a qualified specialist who will ensure there’s no loss of security and no damage during the move process. We have the experience to be able to negotiate any office or home layout – without causing damage to the property, its content or the safe. Along with a prearranged site visit to assess the pathways and area negotiation we will need to carry out when removing a safe, our specialist training and years of experience allows us to professionally remove your safe. We have spoken with a large number of clients who have tried to move a safe themselves, injuring themselves in the process. Don’t let this happen to you, call the experts at Kwik Fab Ltd today.